Even icons need a modern update every once in a while, and that's exactly what the PUMA Suede, the late '60s iconic sneaker got, just in time for the fall and winter seasons. PUMA has transformed its classic Suede Platform with some next level sparkle and swag, by adding allover suede and a jewel detailed toe box. The sneaker pack, available in Black and Marshmallow, also feature metallic foil logos that highlight the shoe's vibrant gems. The blingy pairs take inspiration from PUMA's recent gold toe pack, which boasted complimentary suede uppers and an updated high-end gem material on the toe. Whether you choice light or dark, either color would be a seamless addition to your fall and winter wardrobe. 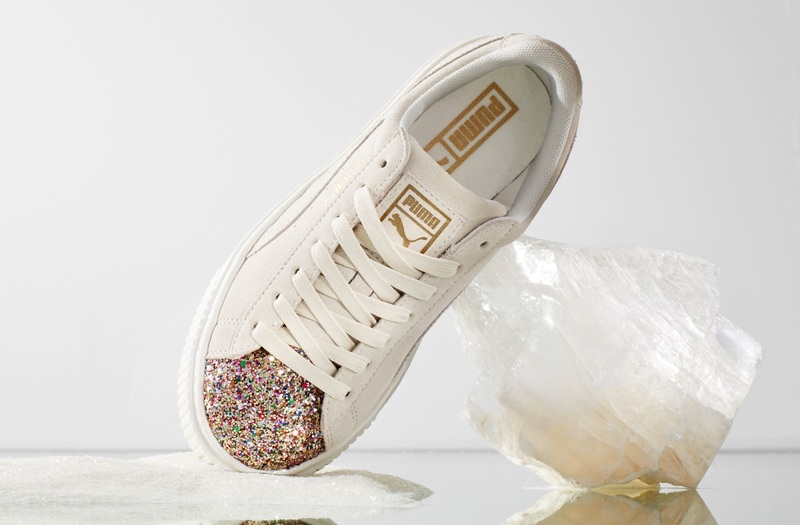 The PUMA New Crushed Jewel Pack launched at the beginning of this month, get your favorite for $100.00 each on www.puma.com.